This month, while many of my fellow history girls are celebrating the Bard, I’ve been thinking about another important literary landmark: the 200th anniversary of the birth of Charlotte Brontë. Charlotte was born on 21st April 1816. In fact, this year marks five years of Brontë bicentenaries, with Branwell’s birth in 2017, Emily’s in 2018 and Anne’s in 2020. The Brontë Society and Brontë Parsonage Museum are celebrating with a programme of events, exhibitions and publications, including a new collection of short stories inspired by Jane Eyre, edited by Tracey Chevalier. 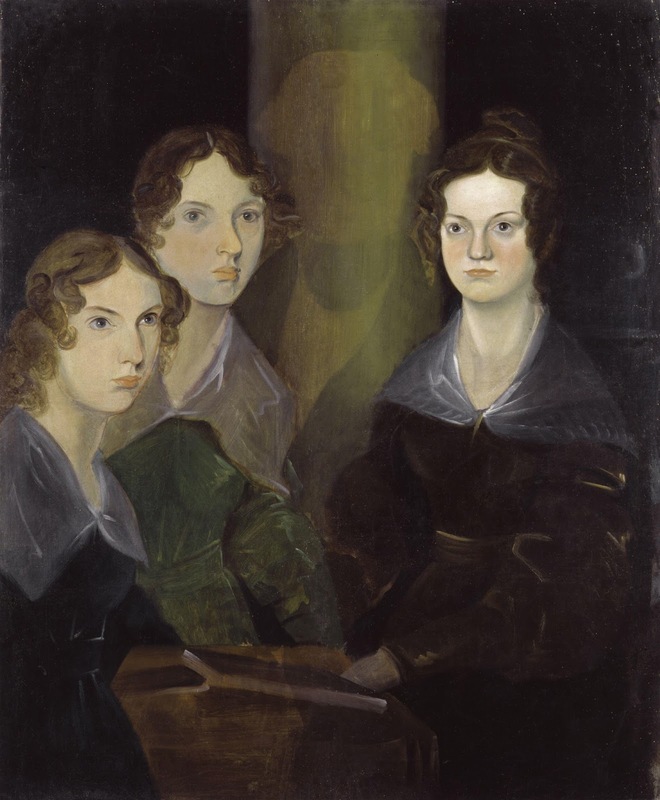 The Brontë sisters by Branwell Brontë, Charlotte on the right. Owned by the National Portrait Gallery. 1. Charlotte’s first ambition was to be a painter. Charlotte was small – though don't know her exact height, estimates based on her clothing suggest she was about four feet-ten inches. Dresses and shoes on display at the Parsonage certainly bear this out. George Smith, Charlotte’s publisher, describes his first impression of Charlotte and Ann as ‘two rather quaintly-dressed little ladies’ and Elizabeth Gaskell wrote 'her hands and feet were the smallest I ever saw'. The sisters all attended the Clergy Daughters School at Cowan Bridge, Lancashire. Conditions were harsh, rations frugal and discipline strict. An outbreak of typhus sent them home in 1825 but the two elder siblings, Maria and Elizabeth both died of tuberculosis soon afterwards. Charlotte blamed the school for their deaths and the deterioration of her own health. She even modelled Lowood School's infamous Mr Brocklehurst on her real headmaster. The founder and head teacher of the Clergy Daughter’s School, Rev William Carus-Wilson, didn’t take kindly to Charlotte’s unflattering representation and sought legal advice. Court action was only avoided when Charlotte penned an apology, stating that she’d exaggerated the details for dramatic effect. She gave Carus-Wilson permission to publish her retraction, but he never did. Elizabeth Gaskell noticed Charlotte’s dental problems when they first met, writing to a friend that she had ‘many teeth gone.’ Charlotte supposedly spent some of her earnings from Jane Eyre on dentistry, writing woefully to her friend Ellen about a proposed visit to a dentist in Leeds. Despite her unfortunate teeth, she attracted the attentions of Reverend Henry Nussey, brother of her friend Ellen in 1838. She refused him – she wasn’t in love. Her second suitor, Rev David Pryce proposed to her the following year after meeting her only once. Despite falling for her married tutor during a stay in Brussels (an interlude that inspired the novel Villette) Charlotte eventually married Arthur Bell Nichols, her father’s curate, accepting his second proposal in 1854. Keen to avoid the limited work open to her as a governess or teacher (all three sisters had attempted these careers with little success or happiness) Charlotte encouraged her sisters to publish their writing. It was she who led the approach to publishers and, by outliving her sisters, experienced the most success in her lifetime. Writers – take heart! Despite her ambition, the first volume of poetry by Currer, Ellis and Acton Bell, published in 1846, was paid for by the sisters themselves and sold only two copies. After the success of their novels, and Anne and Emily’s deaths, a second edition, edited by Charlotte, was issued in 1850 and has remained in print ever since. It’s often said that the inspiration for Bertha in Jane Eyre came from Charlotte’s 1839 visit to Norton Conyers, a 17th century manor house near Ripon that reputedly housed a real madwoman in the attic. There are other more convincing models for Thornfield Hall itself, including Ellen Nussey’s home Rydings and North Lees Hall in Derbyshire, but Charlotte’s visit to Norton Conyers must have sparked her imagination. The exact cause of Charlotte’s death in unknown. She fell pregnant and became very ill shortly after her marriage in 1854. Elizabeth Gaskell writes that she suffered ‘sensations of perpetual nausea and ever-recurring faintness’. Her death certificate, dated March 31st 1855, states that she died of tuberculosis, the same disease that killed her sisters, but opinion is divided and we’ll probably never know. If you’d like to find out more about Charlotte’s life, I recommend the new biography by Clare Harman. And the Brontë Parsonage Museum website is a wealth of information, including details of the Brontë 200 celebrations. I love Charlotte and Anne's novels so much. Especially Shirley and The Tenant of Wildfell Hall. I have read quite a bit about the sisters - but I didn't know Charlotte had such problems with her teeth. Having just broken one myself, I'm inclined to be very sympathetic! Me too, having suffered with a root canal problem for the last 5 months!